Dance on the moonlit foredeck of PALMETTO BREEZE. Cruise by Charleston’s Rainbow Row. See dolphin. Breeze by the birthplace of the Civil War. Any outing is a special occasion when you’re aboard a sailing vessel in Charleston! 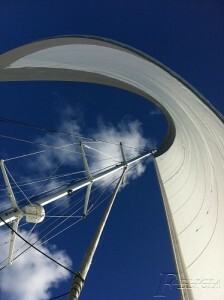 We can match you with the perfect vessel Charleston sailing vessel. You can see the majestic harbor and historic sites. You can see the local birds and dolphin. You can simply sit back, relax and enjoy the sunset! Featuring our classic 50-foot sailing yacht, SERENA. She is US Coast Guard certified and fully insured to carry up to 20 guests plus her crew. Also available is the spacious 100-passenger catamaran PALMETTO BREEZE. In addition to these larger Charleston sailing vessels we offer the largest fleet of Six-passenger charter sailing vessels in the lowcountry ranging from 30 to 55 feet. Catering is available for any charter: from a casual picnic lunch to an intimate candle lit dinner or buffet. We can assist you or you are welcome to handle your own food and beverages. PALMETTO BREEZE can even land your private group on the beach for a barbeque! Crew gratuity is not included. Customary consideration is 15 to 20 percent of the total charter fee, and of course based on service. Catering, alternate boarding sites, golfing/boating packages as well as additional provisioning available for all vessels; rate quotes available upon request. All particulars contained herein and in the associated pages are believed to be accurate and true, and are subject to change without notice. AquaSafaris, Inc. accepts no responsibility for errors or omissions. Verify all rates with your agent. We recommend you bring sunglasses, hat, sunscreen, camera, long-sleeves, deck shoes and a good attitude! During winter months we recommend you bring the same as above, but be sure to dress in layers for the weather. You can always remove layers of clothing depending on the weather. The captain might ask that guests remove shoes that have dark soles, so deck shoes or barefeet are recommended. Catering options available upon request. You are also welcome to use outside catering. A galley fee may apply for outside catering depending upon the vessel you charter. Outside caterer must contact AquaSafaris 7 (seven) days prior to charter date for briefing. Please remember that you are always welcome to bring aboard your own food and drinks. AquaSafaris Inc. requires a 50 percent deposit to confirm your private charter. We accept credit cards, traveler’s checks, cashiers checks and money orders. Balance is due the day of your charter. Cash directly to your Captain, or payment in the office both work well for gratuity. We cannot accept personal or company checks unless received ten (10) days in advance of the charter. All deposits are fully refundable if weather causes cancellation of your charter. Said cancellation is at the sole discretion of the Captain. If YOU cancel the charter, no refund applies. If you reschedule due to a Captain weather cancellation, you may apply your deposit to a new charter date, please check with your agent for details.